Razer has officially unveiled its Tron-themed gaming keyboard and mouse at ComicCon, in conjunction with Disney. The gaming peripherals specialist has used the famous San Diego-based conference of all things geek and awesome to show off if Tron:Legacy branded wares in conjunction with Disney Consumer Products. They include a Razer–designed Tron keyboard, a Tron gaming mouse and a Tron mousemat all incorporating the "distinctive blue glow and custom features inspired by the upcoming Disney film TRON: Legacy"
Tron: Legacy is released on Dec. 17, 2010 in Disney Digital 3D and IMAX 3D, and the peripherals are, as you may imagine, compatible with TRON: Evolution the video game. And, quite frankly, they look absolutely amazing. 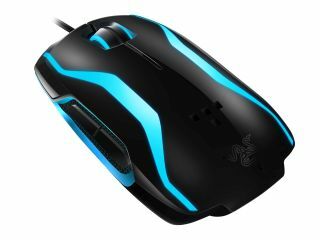 "We are all extremely excited about our collaboration with Disney on a line of high-end gaming peripherals inspired by the upcoming film TRON: Legacy," said Robert "Razerguy" Krakoff, president, Razer USA. "Razer is known for our highly detailed finishes and lighting effects, so as soon as we viewed footage from TRON: Legacy, we were immediately inspired. "Then, we started working to take it to the next level, as only Razer can, with a keyboard and mouse that has digitized sound effects and lighting built into it for the ultimate gaming experience." The pack will cost a not insignificant €149 – that's about £126 in real money – with a UK release date of Q4 2010.